50세 남자로 7년전 급성심근경색증으로 관상동맥 스텐트 후 아스피린, 프리그렐(clopidogrel resinate)을 드시고 계십니다. 신장이식 후 소론도 2.5mg/day와 아드바그랍이라는 면역억제제를 드시고 계십니다. 최근 설사와 혈변(hematochezia)으로 상하부 내시경을 시행하였습니다. 상부위장관에는 출혈병소로 보이는 부분은 없었으며, 말단회장에 1.5-2cm크기의 ulcer가 2개 있어 조직검사하고 검사를 마쳤습니다. 대장에는 출혈할 만한 병소는 없었습니다. Aspirin-induced enteropathy나 CMV ileitis 등을 생각하고 조직검사를 했는데, "Section shows moderate infiltration by lymphoplasma cells, neutrophils and eosinophils in the lamina propria. Active granulation tissue with heavy neutrophilic infiltration and necrotic ulcer detritus are noted. Granulomatous change or viral inclusion are not seen. Ther is no evidence of malignancy. "로 나왔습니다. CMV PCR, Tuberculous PCR 도 시행했는데 아직 결과는 안 나온 상태입니다. 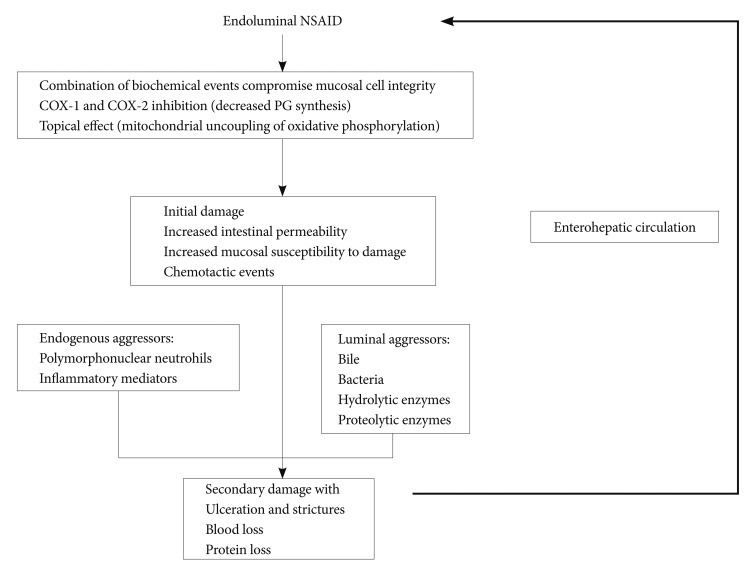 아스피린이나 NSAID-induced enteropathy는 내시경적 특징이 있는지, CMV enteritis나 CMV colitis의 내시경적 특징이 있는지 궁금합니다. 위와 십이지장에 궤양이나 미란이 없이 small bowel에 아스피린이나 NSAID로 인한 궤양이 생길 수 있는지도 궁금합니다. 궁금해서 여쭈어 봅니다. 항상 감사합니다. 어려운 질문인 것 같습니다. 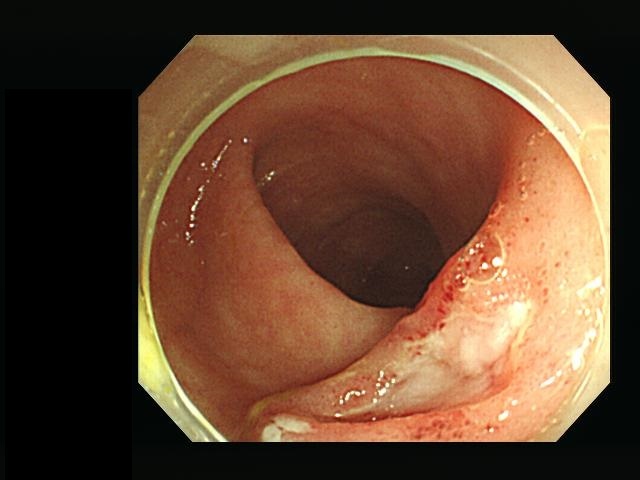 2012년 Clinical Endoscopy에 실렸던 NSAID-induced enteropathy를 참고하시면 될 것 같습니다 (Lim YJ. Clin Endosc 2012). 위장에 생기는 NSAID 점막 손상과는 다르게 NSAID 소장 손상은 그람 음성균과 담즙 때문에 생기며, enterohepatic circulation에 의해 악화될 수 있기 때문에 상부위장관에 병변 없이 말단 회장에만 병변이 발생할 수 있습니다. The pathogenesis of NSAID-induced enteropathy is distinct from that of NSAID-induced gastropathy. Unlike stomach, NSAID-induced lower GI injuries are not caused by sup-pression of prostaglandin synthesis due to inhibition of cyclo-oxygenase (COX) activity but, most of the time, by gram negative bacteria and bile. Bjarnason et al. proposed a "three hit" hypothesis. First, NSAIDs solubilize lipids of phospholipids on the mucosal surface, so the epithelial mitochondria are directly damaged. Second, the mitochondrial damage depletes intercellular energy and leads to calcium efflux and to induction of free radicals, a disruption of intercellular junctions occurs, and mucosal permeability increases in the small intestinal mucosa. Third, the mucosal barrier becomes weakened, so bile acid, proteolytic enzymes, intestinal bacteria, or toxins can easily penetrate into the epithelial cells, resulting in mucosal injury. NSAID-induced small intestinal injuries augment through the enterohepatic circulation of the NSAID. NSAIDs with no enterohepatic circulation did not cause significant intestinal damage in animal models. 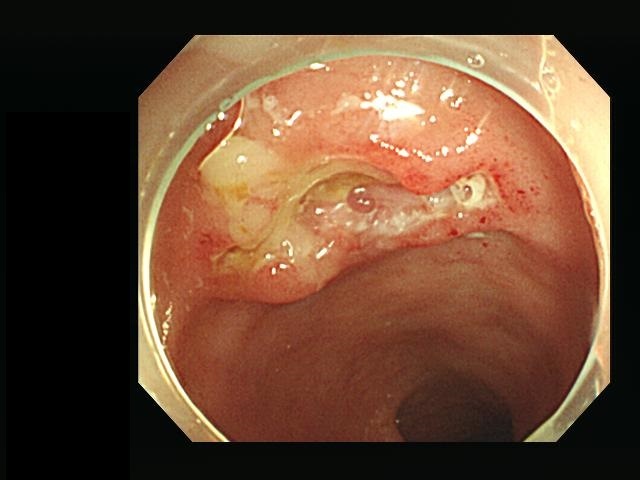 Enteric-coated aspirin의 경우 아스피린의 부작용을 별로 줄이지 못하고, 오히려 소장 손상이 말단 회장 쪽으로 이동되는 경향을 보여, NSAID-induced enteropathy와 거의 유사하게 관찰될 수 있습니다. 병변의 모양은 reddish erosion, multiple sharply demarcated ulcer, concentric stenosis 등 다양하게 발생할 수 있습니다.